Yasushi Inoue's The Hunting Gun, translated by Michael Emmerich (Pushkin Press), elegantly portrays the dangerous, irresistible complexity of illicit love (and its aftermath) in letters from three women--a lover, her daughter and the abandoned wife. Guatemalan author Eduardo Halfon's novel Monastery , translated by Lisa Dillman & Daniel Hahn (Bellevue Literary Press), features the narrator of The Polish Boxer, one of my favorite books in 2012. His intriguing story continues. "But words are not sharks," he observes. "Or maybe they are." In Bridgett M. Davis's haunting novel Into the Go-Slow (Feminist Press at CUNY), Angie is nearly consumed by the irresistible flame that was her older sister's life and death years before. From Detroit to Lagos, Angie retraces her sister's footsteps to find her own path. A search for the perhaps mythical lair of Chinese poet Han Shan is the subject of James P. Lenfestey's Seeking the Cave: A Pilgrimage to Cold Mountain (Milkweed). The ancient poet set the challenge himself: "Men ask the way to Cold Mountain/ Cold Mountain; there's no through trail." "A memory so present that it resembles oblivion," Imma Monsó writes in A Man of His Word, translated by Maruxa Relaño & Martha Tennent (Hispabooks). In this beautifully conceived memoir about the sudden loss of her husband, she observes that "you write to discover what the next step will be." While I confess that Expect Delays (Coffee House, Nov. 11) was my first encounter with Bill Berkson's poetry, I'm pleased my late discovery will now be rewarded by his many books: "I like to have a little secret at the end of my poems,/ The way nothing is ever finished." "Celebrate Halloween and literature at the same time, Buzzfeed advised in showcasing "18 literary pumpkins for a bookish Halloween." "Looking for a last minute literary Halloween costume?" Electric Lit featured Essay Mama's "Halloween costumes of famous authors" and PopSugar suggested "16 literary characters to be this Halloween"; while Buzzfeed unveiled "13 Halloween costumes inspired by YA book covers" and "22 literary Halloween costumes for duos." Flavorwire highlighted "50 of the scariest short stories of all time," and Electric Lit contributed "12 haunting American short stories to read this Halloween" for your spooky reading pleasure. IKEA Singapore's latest ad is "a spot-on recreation of the famous hallway scene" from Stanley Kubrick's film adaptation of Stephen King's novel The Shining. "What do witches fly on in Philip Pullman's His Dark Materials sequence?" In the spirit of the season, the Guardian offered a literary witches quiz. Many Americans received an in-depth introduction to the Ebola virus 20 years ago, when The Hot Zone: The Terrifying True Story of the Origins of the Ebola Virus by Richard Preston (Anchor, $7.99, 9780385479561) was first published. Reading like Stephen King or Michael Crichton, this horrifying, fascinating book has one major distinction from most "mass contagion thrillers": it's nonfiction. While scientists now know more about Ebola--which Preston wrote about recently in the New Yorker--The Hot Zone is still the best book for learning about the origins and the challenges of the virus that's causing such panic in the U.S. and around the world. The outbreak in West Africa has revived interest in Ebola to the point that Hollywood is planning on launching a TV series based on The Hot Zone. By the way, Preston, who has also written other nonfiction and fiction titles, is the brother of Douglas Preston, the techno-thriller and horror novelist (who usually writes with Lincoln Child) and organizer of Authors United, which has sent letters and run ads calling on Amazon to stop punishing Hachette authors in the retailer's ongoing dispute with the publisher over terms. 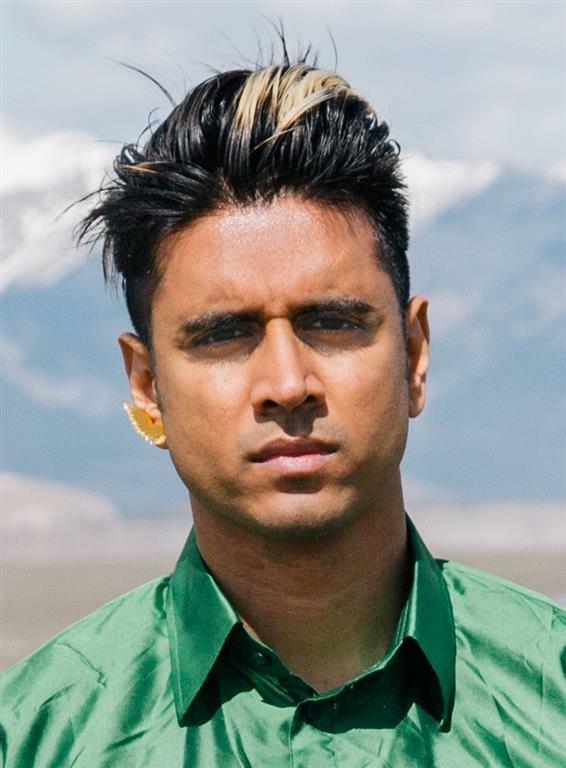 Vivek Shraya is a Toronto artist whose work includes music, performance, literature and film. In his new novel, She of the Mountains (Arsenal Pulp Press), Shraya interlaces a contemporary, queer coming-of-age story with a re-imagining of Hindu mythology. Though vastly different in tone and subject matter, both narratives examine the complex relationship between human beings and their own bodies. Supplementing the text are illustrations by Canadian artist Raymond Biesinger, whose work has appeared in such publications as the New York Times and the New Yorker. She of the Mountains fluctuates between modern times and a re-imagining of Hindu mythology. Is the latter something that's always interested you? Growing up in a Hindu household, I fell in love with the various gods and goddesses largely because Hindu mythology is passionate, gory and magical. This appealed to my childhood imagination. As an adult, I am no longer a practicing Hindu, but Hinduism will always be a part of me and continues to inspire. How has your understanding of Hindism influenced or shaped your perception of gender and sexuality? Hindu gods are often depicted with long hair, wearing jewelry and possessing a soft demeanor, all qualities that in North America are designated to women. So as a genderqueer child, I felt a kinship with these gods. They validated my differences and made me feel less abnormal. In the novel, certain phrases, such as "you're gay," are repeated continuously, sometimes filling an entire page. What are your thoughts on the significance of repetition, both in writing and in life? Songwriting has been my entry point into writing, and in songwriting, repetition is often employed as way to highlight a message. With the you're gay sections in particular, I wanted the reader to be able to viscerally engage with the experience of homophobia, to have insight into what repeated verbal assault feels and looks like. In life, I think many of us have cycles of learning that we repeat. My personal growth has often been connected to understanding why I keep making the same mistakes or creating the same patterns as a way to hopefully, one day, stop. The characters in the novel fight constant skepticism from those who do not understand or accept bisexuality. In your opinion, is this an issue that those who identify as queer or bisexual continue to face? Biphobia is definitely prevalent outside and within LGBTQ communities, and has been a form of discrimination I have personally encountered. There is a pressure to have just one kind of attraction, and an individual who refuses to do so is perceived as closeted or confused. There is even a saying that speaks to this: "Bi now, gay later." This was why the original intention behind the book was to write something that would challenge biphobia. I felt that the only way to do this was to write a bi/queer love story. You work with a range of art forms--What I LOVE About Being QUEER, for instance, was a book, a film and a Tumblr page. How is writing a book a distinct experience? What does it allow you to do or not do, in comparison to other art forms? For me, writing is the hardest medium. I have not quite figured out why, but a good sentence can take me a day, sometimes days to craft, whereas I can generally write a song in a few hours. Perhaps it's because the medium is relatively unstructured, where I literally have a blank page that I can fill any way I choose. This can feel like a lot of pressure. In other mediums, there are limitations. I work well with limitation. Again, to use the example of songwriting, I know I have three to four minutes to get my point across, within a pop format of verse/chorus/verse/chorus/bridge/chorus, or a close variation of this. What I LOVE received a great deal of press, from BuzzFeed to the Huffington Post to Elle Magazine India. Did this response influence the work that came after it? I am grateful for the response to the project but it has not influenced the project. If anything, the response has reinforced the hunger for and the importance of creating self-love models. How else does She of the Mountains differ from your past work? I am fortunate that it is only after I complete a project that I am faced with doubt about it. She of the Mountains is the first project that I have encountered fear during the creative process, an immutable internal nagging that the writing wasn't good enough, would be misunderstood, or wouldn't appeal. This is one of the reasons why this is the most challenging project I have worked on. Currently, I am working on a new exhibit/performance entitled Your Cloud, which will premiere at Videofag in February 2015, as part of Buddies in Bad Times Theatre's Rhubarb Festival. It is an exploration of the weight and disposability of digital communication, and for this I have put out an open call for texts/e-mails that haven't been responded to. Shelf Awareness readers are invited to participate and can read more about this here! Howard Jacobson, author of the Man Booker Prize-winning The Finkler Question, again caught the eye of the Man Booker selection committee, which this year shortlisted J, a dystopian novel that imagines a futuristic Britain radically altered by a cataclysmic event referred to cryptically as WHAT HAPPENED, IF IT HAPPENED. The government and a willing populace have created a repressive society where the past is occluded, lineages are obscured and certain forms of music and art are shielded from memory. The novel follows Kevern Cohen and Ailinn Solomons as they try to form a relationship. Not only must they endure the dramas typical to any union of lovers but they've been robbed of the scaffolding of history; they lack the pop-culture touchstones to reference how those in love feel or behave. While it makes for a raw and touching courtship, their lives are further complicated by the Orwellian specter of local villagers watching their every move and reporting them to unseen overseers. Discover: A dystopian classic, shortlisted for the Man Booker Prize. In The Book of Strange New Things, Michel Faber (Under the Skin; The Crimson Petal and the White) continues to expand the cutting-edge of literature as he explores a marriage in crisis in a novel about evangelizing an alien world. Peter Leigh is a missionary sent to Oasis, a recently discovered planet light years away. His wife, Bea, is left back on Earth, where the situation becomes increasingly desperate, possibly apocalyptic. Their solid, loving relationship is reduced to fumbling, intermittent communications through typewritten notes, as they try to share their diametrically opposed experiences: Peter reaches euphoric moments with his Jesus-loving alien brethren (who call the Bible the Book of Strange New Things), while Bea is increasingly desperate and isolated back home as the world suffers a series of unprecedented natural disasters. Faber manages to convey the emotional rawness and sense of how a few wrong words can send a relationship hurtling into dangerous realms. The speculative aspects of Faber's novel are seamless, intriguing and ultimately shocking, and his descriptions of the planet have that touch of the odd and sublime (on Oasis, even the rain is different). The Oasans are a fully realized species, and why they are so keen, even desperate, to hear the "technique of Jesus" is one of the surprises Faber has in store. Faber manages to weave echoes of imperialism and "white man's burden" into the narrative without making Peter into a straw man of an overzealous evangelist. Discover: Michel Faber moves to a new world in this thought-provoking and ultimately shocking speculative novel. The legions of readers who already adore the writing of Jodi Picoult (The Storyteller) have an (often exceeded) expectation of richly drawn characters, intricately woven plots and resonant conclusions. They have come to expect mastery, and will not be disappointed by Leaving Time. Picoult explores territory that is heretofore uncharted in her career, and to be thrown for a loop by an author whose bestselling work routinely follows a successful formula is a pleasure as unexpected as finding a vending machine has kicked out two chocolate bars instead of one. Leaving Time centers on Jenna, a 13-year-old girl fixated on finding her mother, a scientist who abandoned her a decade before. She is aided by two unlikely allies: Serenity, a pink-haired psychic with something to prove, and Virgil, a crotchety detective whose mishandling of an old case drove him straight to the bottle. All three are connected by their shared pain and begin to bond in surprising ways as they hunt for Alice, Jenna's missing mother. The otherwise-absent Alice gets a voice with first-person chapters covering the time before she left her daughter. These flashbacks provide fascinating insight into both her life with baby Jenna and as well as her obsession with elephants. There's nearly a book within a book about these majestic creatures that will leave readers almost as riveted by pachyderms as they are by this exceptional story of flawed souls and redemption. Discover: A triumphant departure from Picoult's typical (outstanding) body of work. In the Doors' great moody song "Riders on the Storm," we learn "there's a killer on the road." In Riders on the Storm, Ed Gorman's 10th Sam McCain mystery--all of which are inspired by song titles--there is indeed a killer on the loose. But who is he? In the last book in the series (Bad Moon Rising), small-town lawyer Sam had been drafted into the Vietnam War. An accident prevented him from going to war, and after a stint in a military hospital he's now back in Black River Falls, Iowa. One of his very best friends, Will Cullen, who did go to Vietnam, is back and he's not doing well. Sam attends a political reception where Republican Senator Patrick O'Shay announces that a "true man and a true patriot," Steve Donovan, will be running in the local Iowa congressional election. Will, recently active in the anti-war movement, shows up and is brutally beaten into unconsciousness by Steve. Later, Steve is found dead by his car, wheels slashed, struck in the head by what appears to be a tire iron. Discover: A murder investigation that's close to lawyer Sam McCain's heart, in post-Vietnam Iowa. Just in time for fall comes Julie Hasson's ninth cookbook, Vegan Casseroles, filled with recipes that satisfy our hibernation-fueled need for rich, satisfying comfort food without the calories and cholesterol of traditional casseroles. Hasson (Vegan Pizza), who regularly contributes to Bon Appétit, Cooking Light, Vegetarian Times and FamilyFun, knew when she stopped eating animal products that "giving up shepherd's pie, eggplant parm, and cheesy rice casserole was not an option" so she tackled the challenge of creating healthy versions of her favorite dishes. Hasson's vegan casseroles are easily assembled from whole, unprocessed foods without any trans fats or animal products. She encourages experimentation by including a selection of sauces to be paired with favorite veggies, pasta or grains; Hasson believes sauces are the key to great taste and texture since they bind all ingredients together. Beyond standards like macaroni and cheese, potpie and quiche, Hasson includes global favorites, such as enchiladas, stuffed cabbage rolls and kugels. She also provides a list of pantry staples--seasonings, thickeners, sweeteners, proteins, baking aids--with a brief description of each and recommended brands when appropriate (she is a fan of Bob's Red Mill in particular), as well as gluten-free alternatives. Discover: Healthy, compassionate comfort food without the guilt. There is a saying in Mexico: sin maíz, no hay país ("without corn, there is no country"). For many South Americans, corn tortillas represent the staff of life, just as wheat bread does for Europeans. These hand-patted disks of fresh maize trace their roots to ancient Mesoamerica, where the tortilla held important ceremonial functions in addition to providing sustenance. In Tortillas: A Cultural History, journalist and former farmer Paula E. Morton (Tabloid Valley) outlines the powerful forces that fueled the rise of this "life-giving" food from intimate-country-kitchen staple to large-scale, mass-produced global commodity with cross-cultural appeal. Even as Spanish conquistadors threatened to displace fallow cornfields with cattle and wheat in the 1500s, it was not bread that the Spaniards used to appease their own hunger but the versatile and hardy tortilla (wrapped around meat and beans). As pioneers migrated westward on the Ox Bow Trail during the late 1800s, they turned away from costlier staples (eggs and butter) in favor of the inexpensive burrito. When mechanization and industrialization threatened to homogenize the tortilla in the late 20th century, mom-and-pop shops in local neighborhoods kept tortilla-making traditions alive. Discover: A highly readable, fascinating history of one of the world's most consumed staples. For many Western cooks, the complex, layered flavors of traditional Indian cuisine are appealing but intimidating. The diverse spices and aromatics, the preparation of ingredients and the time required for long, slow simmering can make a variety of Indian dishes seem out of reach on a busy weeknight. In The New Indian Slow Cooker, chef and restaurateur Neela Paniz (The Bombay Cafe) presents a solution to these problems: a mouthwatering array of Indian recipes simplified for the slow cooker, without sacrificing flavor. Paniz begins with a primer on Indian ingredients and side dishes, listing essential spices and providing instructions for basmati rice, flatbreads and yogurt. She moves on to a dazzling array of soups, chutneys, meat curries and vegetarian mains, ending with a series of rice dishes. Throughout the cookbook, she includes brief explanations of the dishes' cultural context and traditional preparations, as well as anecdotes from her years in India. Since much of Indian cuisine is built on elaborate preparation, some recipes require a bit of prep work before cooks can walk away from the slow cooker. Paniz takes her readers through these initial steps, providing ample hints and helpful tips. While many recipes showcase traditional flavors (sweet tomato chutney, chicken tikka masala, pork vindaloo), several others make use of innovative, nontraditional flavor blends, such as a pumpkin dish made with fennel-tamarind chutney. Discover: A mouthwatering collection of traditional and innovative Indian recipes, adapted for the slow cooker by chef Neela Paniz. In her foreword to Sharon Gannon's Simple Recipes for Joy, Kris Carr promises the book "has the power to change your life; it may even save it." Gannon and Carr assert that food is the most powerful medicine--one that can transform our lives by changing our DNA--and believe the standard American diet's reliance on animal products high in acidity, saturated fat, cholesterol and carcinogens causes inflammation and oxidative stress, leading to a host of diseases. Gannon has been nourishing joy in her clients and readers through art, yoga and cooking since she opened her first restaurant in Seattle in 1971; in her view, veganism is easier on the planet as well as our bodies. Discover: How the alchemical aspects of cooking--transforming ingredients with water, fire and air--can satisfy body and soul. In Rebellion, Peter Ackroyd reaches the halfway point of his proposed six-volume History of England (begun in Foundation and continued in Tudors). Now, Ackroyd covers the period between the accession of James VI of Scotland, crowned as James I of England in 1603, and the Glorious Revolution of 1688. Dazzled by the relative wealth of England compared to his native Scotland, James I spent far more than his treasury took in. When he incurred the wrath of Parliament as a result, he refused to justify the royal expenditures, instead relying on the Duke of Buckingham to shield him from "mere" politics. His younger son, Charles I, continued both his father's spendthrift habits and acrimony with Parliament, refusing to accept the king's subjection to English common law--a fight that ultimately cost Charles his head and plunged the country into civil war, resulting in the rise of Oliver Cromwell and an interregnum government that wielded absolute military authority. Cromwell's death saw the return of the monarchy in Charles II and his brother James II, the latter of whom found himself banished in a "Glorious" (bloodless) rebellion three years after his coronation. Discover: A detailed look into the lives of 17th-century England's rulers and their battles with Parliament. In 1889, 27-year-old Florence Maybrick was tried in a Liverpool court for the murder of her husband, James. The press and public were enthralled by the so-called "Maybrick Mystery," which had all the elements of a scandalous sensation: a young American heiress, a wealthy cotton merchant, arsenic poisoning and intimations of the pretty young Mrs. Maybrick's infidelity. Florence married James when she was 17 and he was 41. While the match made both families happy, the relationship soon soured. In debt from James's business failures, plagued by his refusal to set aside his mistress and surrounded by gossiping servants whom she could not control, Florence had taken to lamenting her situation in lengthy letters to her mother and to a business acquaintance of her husband: a handsome young bachelor named Alfred Brierley. She had also begun soaking arsenic-infused flypapers in a basin in her boudoir, ostensibly to make a face wash. Meanwhile, James, a noted hypochondriac, had added several new physicians to his regular rotation, each of whom diagnosed him with a different disease and prescribed different medications--including concoctions whose ingredients might combine in dangerous ways. Discover: A suspenseful retelling of one of Victorian England's famous "true crime" cases. Newbery Medal–winner Neil Gaiman (The Graveyard Book) retells Hansel and Gretel as a story of parents plotting a murder by neglect, with full-spread India ink compositions by Lorenzo Mattotti as dark and terrifying as his forest setting. Gaiman reaches back to the tale's Grimm roots, at a time when Germany was besieged by war and food was scarce. After hunger pangs wake Hansel in the night, he hears his mother suggest to his woodcutter father that he take their children deep into the forest and "lose them." With four mouths to feed, she suggests, "we'll all die. Without the extra mouths, you and I will have a chance." Mattotti's swirling black brushstrokes leave licks of white flames where the children's father has built a fire for them in the forest, in the upper left corner of one illustration, and readers can just make out the father's axe, eye and hand in the lower right-hand corner as he leaves them to their fate. The artist creates each wordless double-page scene as menacing unexplored territory revealed to readers alongside the two siblings, from their discovery of the old woman's gingerbread house, to the suggestion of Hansel's cage, to the oven swallowing their captor like a hungry mouth. Discover: Newbery medalist Neil Gaiman's haunting take on Hansel and Gretel, with a frightfully imagined forested world by Lorenzo Mattotti. Becca Fitzpatrick (the Hush, Hush saga) here pens an adventurous stand-alone romantic thriller. Seventeen-year-old Britt spent months training for a spring break hiking adventure in the Teton Mountains of Wyoming. "Anyone could camp. Backpacking required skill and moxie." She's struggling to move on from the callous breakup with her first boyfriend, Calvin. The trip was supposed to be cathartic and healing--until Calvin is appointed chaperone. Her adventure turns dangerous when a blizzard strands her car. She finds a cabin occupied by two mysterious men, Shaun and Mason. They're stranded, too, and fugitives who desperately need to get off the mountain. Britt's knowledge of the area could be their salvation, so they take her hostage. Each of the men treats Britt very differently. Shaun is volatile and physically abusive. Mason has a mysterious kindness, which she doesn't know how to interpret, and finds increasingly alluring. "I've seen the way you look at me, Britt... I'm not the same as Shaun but I'm not good." As they hike down the mountain, Britt holds out hope that Calvin will come to her rescue. But soon she doesn't know whom to trust when she stumbles upon evidence of a series of murders. Britt has a tormenter and a protector, but can she figure out which is which, and who might be guilty of murder? Discover: A spring break hiking adventure turns dangerous--and possibly deadly--when two desperate criminals kidnap a teenage girl.